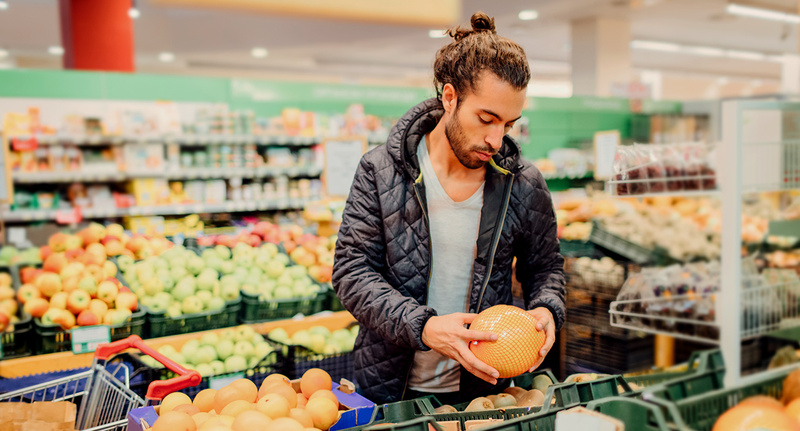 How to Budget Groceries: 11 Easy Tips - MintLife Blog Once you learn how to budget groceries, you’ll never go over your food budget again. Check out these easy tips to save without sacrificing quality or flavor. Have you ever sat down to go over your budget only to find out that you’ve outrageously overspent on food? Local, organic, artisan goods and trendy new restaurant outings with friends make it easy to do. With food being the second highest household expense behind mortgage or rent, our food choices have a huge impact on our budget. You may be surprised to find out that the most nutrient-dense foods are often the most budget-friendly. It’s not only possible, but fun and easy to eat nourishing, delicious food while still sticking to your budget. Here are 11 ways to help you learn how to budget groceries. Before you figure out what you should be spending on food, it’s important to figure out what you are spending on food. Keep grocery store receipts to get a realistic picture of your current spending habits. If you feel inclined, create a spreadsheet to break down your spending by category, including beverages, produce, etc. Once you’ve done this, you can get an idea of where to trim down spending. How much each household spends on food varies based on income level and how many people need to be fed. Consider using a grocery calculator if you’re not sure where to start. While people spent about 30 percent of their income on food in 1950, this percentage has dropped to 9–12 today. Consider allocating 10 percent of your income to food as a starting point, and increase from there if necessary. This is the least fun tip, we promise. Eating out is a quick and easy way to ruin your food budget. If you’re actively dating or enjoy going out to eat with friends, be sure to factor restaurants into your food budget — and strictly adhere to your limit. Coffee drinkers, consider making your favorite concoctions at home. It’s much easier to stick to a budget when you have a plan. Plus, having a purpose for each grocery item you buy will ensure nothing goes to waste or just sits in your pantry unused. Don’t be afraid of simple salads or meatless Mondays. Not every meal has to be a gourmet, grandiose experience. Keep a magnetized grocery list on your fridge so that you can replace items as needed. This ensures you’re buying food you know you’ll eat because you’re already used to buying it. 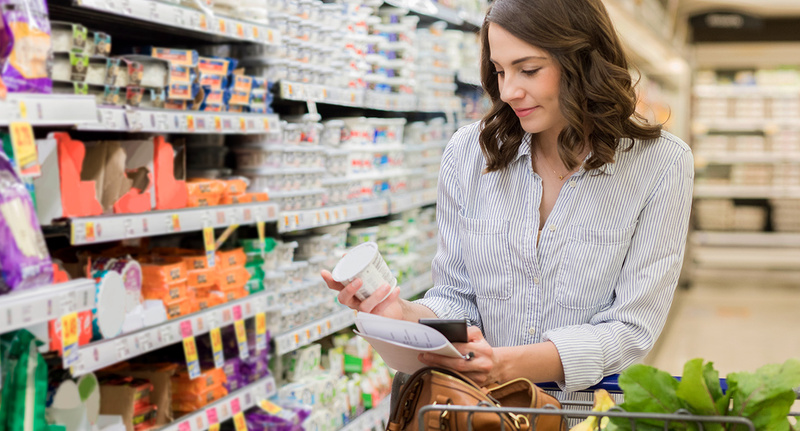 Sticking to a list in the grocery store is an effective way to keep yourself accountable and not spend money on processed or pricey items — there’s no need to take a stroll down the candy aisle if it’s not on the list. If your mother gave you this advice growing up, she was onto something: according to a survey, shoppers spend an average of 64 percent more when hungry. Sticking to a budget is all about eliminating temptations, so plan to eat beforehand to eliminate tantalizing foods that will cause you to go over-budget. 50 percent off ketchup is a great deal — unless you don’t need ketchup. Beware of coupons that claim you’ll “save” money. If the item isn’t on your list, you’re not saving at all, but rather spending on something you don’t truly need. This discretion is key to saving money at the grocery store. Not only is the bulk section of your grocery store great for cheap, filling staples, but it’s also the perfect way to discover new foods and bring variety into your diet. Take the time to compare the price of buying pre-packaged goods versus bulk — it’s almost always cheaper to buy in bulk, plus eliminating unnecessary packaging is good for the planet. Bonus: a diet rich in unprocessed, whole plant foods provides virtually every nutrient, ensuring optimal health and keeping you from spending an excess amount on healthcare costs. Picture this: you’re trying to stick to a strict food budget, and one day at work you realize it’s lunchtime and you’re hungry. But alas, you forgot to pack a lunch. All the meal planning and smart shopping in the world won’t solve the work-lunch-dilemma. Brown-bagging your lunch is key to ensuring your food budget is successful. Plus, it can be fun! Think mason jar salads and Thai curry bowls. Would you ever consider throwing $640 cash into the trash? This is what the average American household does every year — only instead of cash, it’s $640 worth of food that’s wasted. With millions of undernourished people around the globe, throwing away food not only hurts our budget but is a waste of the world’s resources. Tossing food is no joke. Eat your leftovers. To avoid wasting food, freeze things that look like they’re about to go bad. Fruit that’s past its prime can be frozen and used in smoothies. Make double batches of soups, sauces, and baked goods so you’ll always have an alternative to ordering takeout when you don’t feel like cooking. Sticking to a food budget takes planning and discipline. 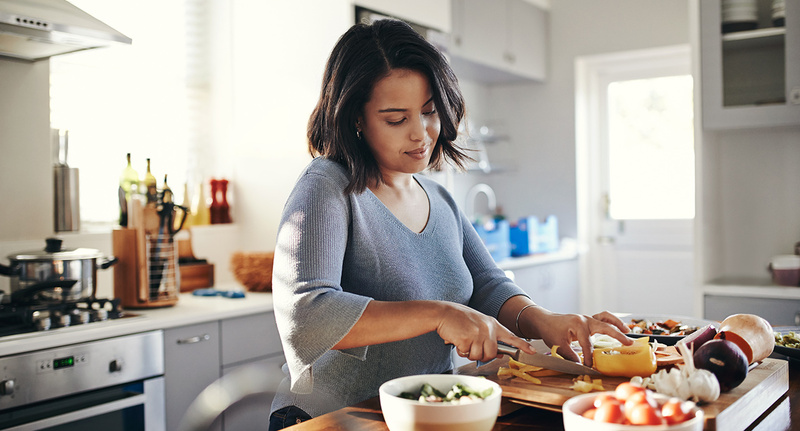 While it may not seem fun at first, you’ll likely find that you enjoy cooking and trying a variety of new foods you wouldn’t have thought to use before. Being resourceful and cooking healthfully is a skill that will benefit your wallet and waistline for years to come.